Several Nike Elite fans loved the exceptional comfort provided by the 9th version of this shoe. It is very light and significantly lighter than the earlier version. The price is considered by some as very reasonable. A handful of runners noted that the cushioning is clearly softer and more forgiving than past iterations of this shoe. It has a responsive ride, based on the comments of some reviewers. The Flymesh upper breathes well and hugs the foot in comfort and security. The new Zoom Air unit in the forefoot makes the shoe snappier than before. A few reviewers remarked that the grip excels, even on wet areas. The Zoom Elite 9 is versatile where distance and speed are concerned. As noticed by a moderate number of runners, it is strong enough for almost any mileage and fast enough for short and quick runs. Many runners were impressed by the smoothness of the ride of this shoe. Heel strikers do not get to enjoy the responsive Zoom Air technology in the forefoot. A few runners were frustrated by the shallow toe box. The Nike Elite 9 lacks reflective details. Several runners had to go up in size to get the best fit. Most runners consider the Air Zoom Elite 9 as either a Pegasus 33 on a diet or a brawny Nike Streak 6 in Nike’s line up. The shoe shines when used for up-tempo runs and distances ranging from 5Ks to full marathons. It has a snappy ride, good arch support, and effortless transitions. Overall, the Elite 9 should be a more than expected sight on the road this year. When shopping for the Nike Air Zoom Elite 9, my goal was to find something with a wide range. I was looking for a shoe to run on roads for a long slow day or bring to the track and throw down 400s with the middle school cross country team. This shoe has an ability to hit the trails for 10+ miles after cross country practice. It was helpful to not have to carry two different shoes with me on a daily basis. What I learned was this shoe was more versatile than I could have ever imagined. After wearing these for most of a trail marathon training cycle, I decided to forego lacing up my trail shoes and chose Zoom Elite 9's on race day. I found these shoes matched my neutral stride and mid-foot strike quite well. What first had me interested in the Zoom Elite's were the complete rubber out-sole and the light weight. The outsole of the Zoom Elite 9 includes rubber from heel to toe. As I was planning to have this shoe double as my daily trainer and trail runner this was a must. I found the rubber grippy in all road conditions (wet, rainy, and even a little snow). They also provided plenty of bite on single track dirt and gravel trails, however, I would not recommend them for a muddy trail or one that includes many slick/wet/mossy rocks. I have put about 350 miles on this pair with wear showing on the toe and heel at about mile 250. The upper includes both flymesh and flywire setup. I found this setup both forgiving and durable as I blow through the uppers of many shoes within a couple hundred miles. 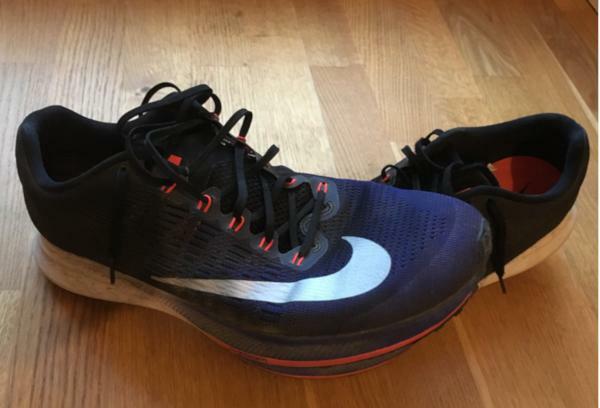 The Zoom Elite 9s are still without holes or rips at 350+ miles. The upper is also stable. I am able to lock down my foot and get a comfortable fit, good for 2-3 hours on the trails without adjustment. I have noticed two areas of concern. One, the laces need to be knotted tightly or even double knots do not hold. Two, I found the angle of the heel counter a bit steep and I would have to make sure to not tighten the top lace too tight or I would feel added stress to my Achilles. This shoe is responsive and you get good ground feel. The Zoom Elite 9's do not provide a whole lot in the way of plush cushioning. However, I did feel it was enough for 20+ mile road and trail runs. The Nike Zoom Elite 9 is a workhorse. 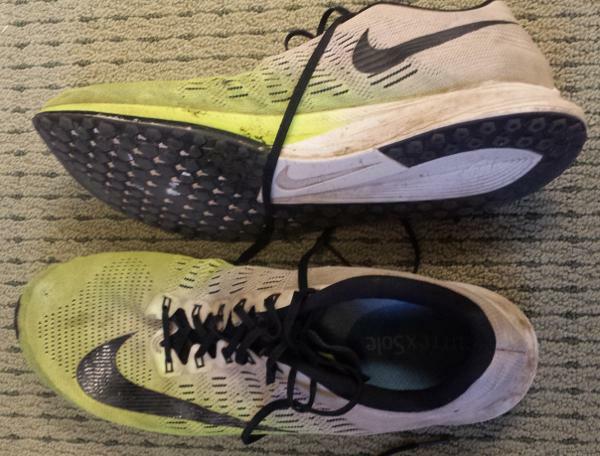 I have done it all in these shoes from track workouts to a trail marathon. They are durable, they are responsive. Are you looking for a shoe for your speed work days and use it again for a long slow run? If the answer is yes, put the Nike Zoom Elite 9's on the top of your list. At first, it feels as though there is a slight bump under the ball of the foot, this sensation relaxes after a couple of runs. I would say this is due to the Zoom Air pocket found in the forefoot of the Zoom Elite 9's. Is this the shoe for your next 100-mile ultra? Probably not. Does it have the responsiveness of a daily trainer from intervals to long slow runs? Absolutely. After running for nearly a year, my overall performance and weekly distance coverage significantly improved. I was learning a lot via online research about different running techniques, training variations and available gear. I incorporated in my schedule tempo and hill runs plus interval training to keep things interesting. I figured that a good way to maximize my speed potential would be to get myself a so-called “fast-day shoe”. I love my comfy spongy sneakers, don’t get me wrong, but is it’s always nice to buy new gear. After seeing all those hyper-positive reviews of Nike Zoom Elite 9 and hearing how versatile and fast they are and that many top athletes were beating some solid records while racing in them, I knew that it is time to break my piggy bank and spend some money - $180 AUS to be exact. Elite 9 comes in several interesting variations. Two colors blending seamlessly with a big Nike mark running through the side. They look like they mean business. If you decide to grab them from the rack, prepare to break some sweat. I did notice on some occasions that people cannot help but look with pure admiration while I am flying past them. I would not carry them casually, but I guess fast running units are built for fast running and fast running exclusively. Every aspect of the design is there to make them perform their best. Like a racing car, no place for unnecessary weight. That comes with a certain appearance. You will look like a star on the track, but not so much while doing your weekly grocery shopping. With great shoe comes great responsibility. If you choose to slide your foot into AIR ZOOM, you are obligated to run like wind. I am not 100% sold on the visuals yet. I do prefer a more minimalistic approach and those can be described as flashy type. I will learn to love them. I went true to size which is US 11. I was guiding myself based on my Adidas size perfect fit, but when we check the European size conversion, there is a slight difference. 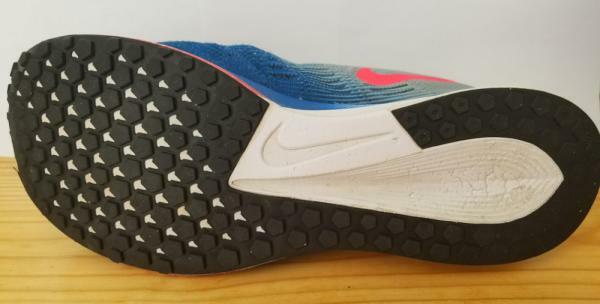 After 100km in them, I didn’t encounter any issues and I am hopeful that nothing will change in that area, it is just bit smaller space between the end of your longest toe and end of the shoe. Some blood blister came out, but it could be from overtraining as I run a lot. I would recommend just in case to go a half size up. You have plenty of room in the forefoot and it gets bit snugger while moving towards your heel which combined with FLYWIRE lacing gives a nice solid and comfortable lockdown. Super light model, according to my kitchen scale they are close to 250g give or take. They sit nice and firm on your foot while not being too restrictive. I am a huge fan of how that shoe feels on your foot. The upper has an interesting construction. On the outside we have a FLYMESH layer with FLYWIRE lacing, then there is that thin tongue which is attached to the sides creating an inner sock-like sleeve which is going all the way down wrapping your foot nicely. It is a one-piece build. FLYMESH is very comfortable and breathable but not as stretchy like FLYKNIT for example. It is super light and the toe box is nice and wide, great for people with a wider foot like me. Laces are on the thin side, so it may create problems for some. I always double knot before running so It is ok. I do have this feeling though that they lose just because they are long and tend to bounce around a bit. So sometimes I will need to stop to check, creates a bit of paranoia. It is made of CUSHLON which is an upgraded Phylon foam. The main fact here is, that it is super lightweight. Zoom airbag cushioning system from what I’ve checked allows for extra stability due to the thin build which brings your foot closer to the ground. In short, the way it works is that when the foot lands on the ground it compresses to absorb the impact and springs back providing runner a boost of acceleration. It is still comfortable but because it is not as cushy as the other shoes I have, it is way more responsive. It seems right as I can feel that during my runs, and usually when wearing those I try to push hard. Just the shape of the midsole gives you that feeling of motion. It looks flatter than it is as we still have here an 8mm drop which I think it is bit much for a racing sneaker. Majority of the outsole is covered by a thin layer of carbon rubber DURALON with a nice hexagonal pattern. It has a nice grip that allows running great in a vast range of terrains. Looks solid and have great traction. I took them for several bush runs where I was jumping on wet rocks, felt good and no damage to the body received. Even though it is slim it is quite durable. After 100km of usage, it is not showing any wear at all. It rides great. If I would give a nice wash to the upper they would look like a brand-new pair. I would not use them on my weekly long runs too often as I still prefer a bit more cushioning like the Nike Epic React which I am using in the rotation now, but it is a definitely a great choice when I want to hit a fast pace or want to do some hills. They hold on to your foot like their life depends on it. Price - for the quality, the $180 retail is a no brainer (now on sale even for $120). Weight, it is super light. Great fit, the way the shoe feels on your foot is priceless. Performance, you will be obligated to break speed records on each run. Look, it is just bit too out there, for my taste. Upper could be bit stretchy. Lower drop for that type of sneaker. For the price you are paying, Nike is rewarding you with a versatile shoe filled with great tech, light weight, and speed. They do not disappoint when you want to pick up your pace and they can be trusted on tricky terrains. Good for training, racing, casual runs. The great fit will make your feet feel at home. Initially, after purchase, I did not give them enough love as I was hugely attached to my Ultra boosts and Lunar epics, but now as I grew as a runner and some of my shoes retired, I got them in my rotation and our relationship seems to be blossoming. It is interesting, but just recently I took them for some tempo runs and I did achieve an excellent time. I ran very successfully a 13km race lately and in the upcoming half marathon I am still undecided which sneakers to go for, but Elite 9 is in the top two contenders. It took me a moment, but like I was saying they are growing on me and I will be using them more and more. They are high end running shoes and they do not break your wallet. Comfortable plus something is telling me that they will last long. I highly recommend that if you love running, give them a try as they are worth it. They will bring a smile to your face and sweat to your forehead. This is an excellent both light and versatile, bargain pair of shoes from Nike. With few frills and no hype behind them, in a year of huge campaigns by the swoosh, they quietly get the job done - from speed work all the way to the marathon. They are also widely available for quite discounted prices, as the 10th iteration of the Zoom Elite line is already available, I found my own pair at a factory outlet for about 50 EUR. The only downside to these is that they probably won’t appeal to heel strikers, as the zoom air cushioning is more noticeably present in the forefoot. But for me as a mid/forefoot striker, they made me want to run fast but supplied just enough cushion to get me through my first marathon. The upper feels snug but very well ventilated. I never had problems with lockdown or slippage, either in the heel or forefoot. It just so happened that only a half-size up from my normal size was available, so that may contribute to my feeling that this was a spacious enough shoe regarding toe splay, even though many Nikes tend to be more on the narrow end of the spectrum, and I have a slightly wide foot. When I first tried them on, they definitely felt like a nicely cushioned pair of socks. The combination of the single-layer Flymesh with the inner mesh sleeve works really well for most seasons though I haven’t tried them yet on in very wet or cold conditions. The Flywire provides a good snug fit, to the point that I’ve tried a heel-lockdown lacing technique and it didn’t make any noticeable difference. I was really impressed with the breathability of the upper, and that it didn’t sacrifice on durability. I must admit, strictly from a running shoe aesthetic, this one has a cool or unique ‘personality,’ with the appearance of heat streaks. It's like a rocket coming back through the atmosphere (at least that’s my interpretation). I really like the colorway. I’m a fan of purple, and it makes me think of the late, great musician Prince. I also like the combo of black and the pink highlights on the Flywire. What is not appealing to me is the jumbo swoosh across the front of the shoe, in silver no less. That in itself prevents me from wearing this shoe outside of running, which is a shame, as running shoes are my primary mode of transport, and "retiring" the shoe to a civilian role once it’s training days are over, would have been nice. However, I just feel like big companies get enough marketing exposure. Is a small-ish logo on the side of the shoe, not enough? Is it just me or do most people actually like having so much branding ever-present on gear, like a big logo on one’s forehead or across a shirt? I’ll jump off the soapbox now though, back to more important matters. As a mid/forefoot striker I really dig the Zoom Air unit in the forefoot, that was actually what sealed the deal for me on these. I was choosing between the Zoom Streak Flyknit and these. I felt like for the distance, I was aiming for a marathon, and I’d want some of the extra cushioning - which you can definitely feel in a side-by-side comparison. At around 76 kg, I don’t have a ‘light frame,’ so the cushioning seemed lean but adequate for me. However, it depends on what you’re used to, and what you’re looking for. I must admit that I haven't tried any high-cushioned shoes, and at that moment of choosing, I had just read Born To Run, so was inspired to go with something on the minimal end of the spectrum (at least for Nike), while keeping within a budget. The shoes did perfectly for getting me through the Berlin Marathon, however at some points after the 30km mark on race day, as well as long runs, a little more cushioning would have been most welcome. Bottom line, they did work, and I didn’t have much trouble recovering from my first 42 km. As you can see, the rubber on the outsole has held up really well, considering that I’ve logged over four hundred kilometers, primarily on pavement, gravel, and a little dirt. There’s a bit of wear on the heel, but otherwise, the hexagonal lugs are fairly intact, and there definitely seems to be quite some life left in these. The rubber definitely provides good traction on most surfaces, although I have tended to opt for a weatherized pair of shoes (Adidas Supernova GTX) when there’s been rain or snow, so I haven’t put them through a ton of wet weather running. There haven’t been any noticeable problems at all in this department. The Zoom Elite 9 has been my go-to shoe for speed work, as well as longer runs where I wanted to feel ‘lighter’ and go faster, instead of opting for my slightly heavier workhorse pair of shoes, the Brooks Ghost 9. With an 8mm drop, they also give a good amount of ground feel and aren’t overly aggressive. As to their lightness, I’d like to give some perspective, when I tried on the Pegasus Turbo. The attendant asked if they felt light (and he clearly expected me to be blown away), but I had to be honest that those didn’t feel that light because I was used to the Zoom Elite 9 (not factoring in the amount of cushion provided). I’ve been very happy with how these have performed and held up, and cannot find any fault in them. The Zoom Elite 9 is an excellent option for those who can’t (or simply won’t) splurge on a pair of running shoes but also want a great quality shoe. They’re lightweight, durable, and perform in a wide variety of training scenarios. The cushioning is great for most distances, although as I mentioned, could be a little more if you’re really planning to log lots of runs over 30-35 km. I wouldn’t use them on easy days either, as they are definitely built for speed. There’s no marketing hype or bells and whistles behind these shoes, just a simply great all-arounder that performs time and again. I would definitely buy these again, or continue to try out future iterations of this series. The Nike Zoom Elite 9 provides a very light, comfortable shoe. I think it's best for people with narrow feet, who like to feel the road beneath them. If you want a light, responsive shoe without a ton of padding, this is for you. If you're looking for a plush feel underfoot, then look elsewhere. I came to the Zoom Elite 9 after many happy pairs and over 2000 miles worth of Zoom Elite 8. I found them to be one of the best value running shoes I had ever owned. This opinion was also shared by some of the elite runners in my local running group. We were all very aggrieved when Nike chose to discontinue the Zoom Elite 8, and I was suspicious of the Zoom Elite 9 ability to fill the gap. So coming into this with a completely unbiased opinion, I bought my first pair of Zoom Elite 9, figuring I'd give them a chance rather than start from zero and begin a new shoe search. While I still liked the Zoom Elite 8 better, I found the Zoom Elite 9 to be a very agreeable shoe, albeit different from its predecessor. This is definitely one of the narrower shoes I've owned. For me, and others with narrow feet, this is excellent. Maybe better than excellent. Perhaps a Godsend. I've rarely had a shoe fit like a glove, and this one did. The toe box was comfortable and not too tight, and the heel fit neatly. I had to lace it with a heel lock pattern, to provide more pressure into the heel. My first thought on putting this on was "Oh no, I just bought a minimalist shoe!" I am not one of those runners that can pound the pavement for hours on end with minimal padding. I need to have a medium level of cushion to keep my joints happy. The Zoom Elite 8 met this need perfectly. However, after giving the Elite 9 a chance, I found that while they didn't feel quite as supportive as the 8, I could still turn out long runs with no ill-effect. On the plus side, you can feel the road very well, which saved me from a few turned ankles on uneven surfaces. If you find the cushioning to be a problem, you may see that an aftermarket sole gives the Zoom Elite 9 a better fit and cushion for your personal tastes. The fabric upper is very thin, but adequately firm when running if you lace it well. I was suspicious of its durability but found that it lasted past the 400-mile mark, including serving as my hike-in, hike-out shoe at Mount Rainier. The shoes started to show a hint of wear in the toe at the end of that trek but didn't wear all the way through. That pair still serves for easy treadmill days on occasion. The heel fabric is super soft and comfortable. Well into my second pair I've never had any chafing or issues. At first glance, the sole looks like a very simple, uniform, dimple pattern reminiscent of a 1980's sneaker. While it doesn't have the look of a highly engineered racing tire, it has done perfectly well for me on varying surfaces. The modest lugs are quite adequate for packed and gravel trails and moderate terrain (think dirt trails, not mud/snow/ ice), and still feel at home on wet pavement. Laces are super light, flat, and very short which is different than most shoes. If there is one part of the shoe I would change, it would be the laces. They have an almost uncanny ability to come undone, and I've had to relace in the middle of a run on more than one occasion. I've learned to double knot them very well to avoid this. Like the laces, the tongue seems uncannily short and barely peeks up over the top of the upper lacing. However, I have had no problems with it, and have never even thought about it until writing this review, which is probably a good sign. The Zoom Elite 9, like its dearly departed predecessors, is a great value for the money and provides a great overall running experience. It is best for runners with narrower feet that want a very light shoe, don't require a plush amount of cushion, and who appreciate a good amount of road feel. I just bought three pairs in anticipation of it being discontinued. 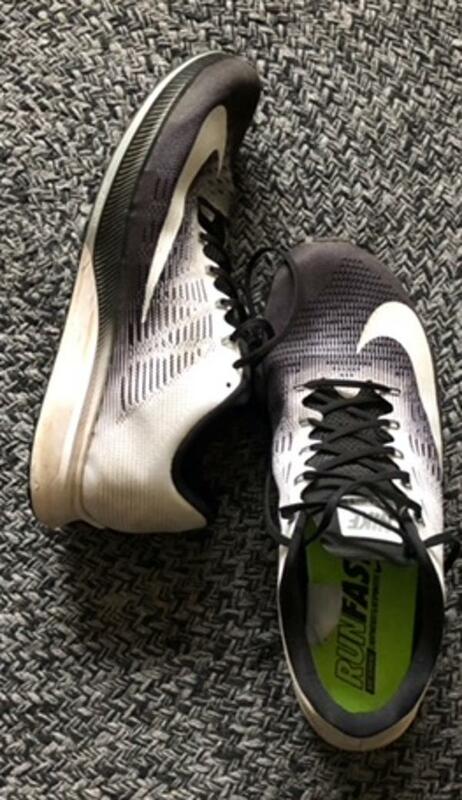 The midsole of the Nike Air Zoom Elite 9 was updated. It now used the Cushlon LT midsole that is designed for a lightweight cushioning. The Cushlon was extended in the entire midsole for a more resilient ride. The 9th version of the Air Zoom Elite still features the Duralon rubber compound, but in this version, the rubber compound was extended in the entire outsole for durability and added underfoot protection. The upper of this lightweight shoe was also updated to deliver a more breathable, and comfortable fit. It still uses the Flymesh material, but added to it is the Notched Inner Sleeve that offers an enhanced comfort and a snug fit. The Nike Air Zoom Elite 9 offers an improved fit because of the modification in the upper and the addition of an inner mesh sleeve. The heel and midfoot areas of the shoe accommodate runners with narrow to medium foot measurement. The forefoot is a bit narrow and not ideal for runners with wider feet. The shoe is available in standard D and B widths for men’s and women’s versions. The Duralon rubber compound is extended in the entire outsole of the Nike Air Zoom Elite 9. It gives durability to high-wear areas and added underfoot protection for an improved running experience. The waffle-pattern outsole is specifically designed to provide a reliable multi-surface traction and added cushioning. The midsole of the Air Zoom Elite 9 utilizes the full-length Cushlon LT midsole foam that delivers reliable cushioning for a more resilient ride. The Zoom Air placed in the forefoot also gives added flexibility for a more responsive ride. This ride quality is also experienced in the Nike Elite 10 as it features the same Zoom Ait element. With the single-layer Flymesh upper, the Nike Air Zoom Elite 9 offers a great combination of seamless support and breathability. The Flymesh material was modified to reduce weight while improving the overall fit and feel. The inner mesh sleeve in the forefoot and midfoot wraps the foot for an unmatched fit and comfort. The Dynamic Flywire technology joined with the laces delivers an enhanced midfoot lockdown and it generally improves fit without adding weight. The shoe comes with an asymmetrical lacing that wraps the foot comfortably while the heel counter holds the heel securely for an enhanced running experience. Lastly, the EVA sockliner follows the natural curvature of the arch and heel to give added comfort and support.